Los Angeles may be one of the most beautiful cities in the United States, and enjoy one of the best year-round climates in the world, but homeowners here know that there is the potential for real nightmare to strike – especially when they find their property to be infested with termites and need to call a termite control Los Angeles Specialist. Termites have always been a problem in LA (and throughout the Orange County region, for that matter), literally eating away at millions and millions of dollars of prime property and causing untold amounts of damage along the way. Thankfully though, with the help our of Los Angeles termite control services, we will be able to figure out whether or not you’re dealing with termites in the first place and then how to best deal with them going forward. After contacting our services, one of our expertly trained Los Angeles termite inspection technicians will arrive on site and begin moving forward with our patented inspection process. Each and every one of these technicians have been trained to look for obvious signs of termite damage as well as not so obvious signs of termite damage, checking each and every nook and cranny throughout your property for these nasty little bugs. The entire Los Angeles termite inspection might only take 30 minutes or so, but a wealth of knowledge is going to be collected throughout this 100% free inspection – and you’ll get access to every single piece of that information. Even if you choose not to move forward with our LA termite control services, we want to make sure that you understand EXACTLY what you’re going up against and where your real trouble issue areas are. As we mentioned above, termites are a pretty common problem here in Southern California and are definitely a problem in Los Angeles, and it’s not going to be all that surprising if our inspection comes up positive for termites. Should this be the case, our technicians will tell you exactly where these termites are, where they are “headquartered”, and where they are expanding. We are able to determine all of this based upon the amount of damage that has already been done and the spread of damage throughout your property, and as our technicians move through their inspection they’ll be coming up with ways to better protect you against this attack. Obviously, we not only recommend that you move forward with Los Angeles termite control solutions immediately after discovering that termites are in fact living in your home and destroying it from the inside out, but we also recommend that you take advantage of termite protection LA services that will insulate your home from future termite attacks after the current issue has been resolved. This essentially wraps your home in an invisible bubble and barrier to provide you with legitimate Los Angeles termite protection, making sure that after our services are rendered you don’t ever have to worry about another attack taking place! We understand that this “one-two” punch may not be the only way to deal with termites in Los Angeles, but after years and years of experience in the termite control Los Angeles community we understand that it is the best way to deal with termites. Our termite control Los Angeles technicians will set up our proven solutions to destroy termites wherever they are found and almost immediately after cleanup will begin going about protecting you from any future attacks going forward. The best way to resolve your issue right now and guarantee that you don’t have to deal with any other issues in the future. How much will these termite control Los Angeles services cost? It’s challenging to provide you with a concrete estimate for how much specific termite control and termite protection LA services are going to cost without knowing the specific issues you are contending with right now. That’s really something that is better answered after one of our technicians have arrived and performed a 100% free consultation and inspection for you. We can tell you, however, that our Los Angeles termite control and inspection services are some of the most affordable in the area. For years now we have been providing these kinds of services to Los Angeles and the surrounding communities, and we have been able to build up a tremendous reputation – a sterling silver reputation – not only because of the top-notch services that we offer, but also because of our fair prices. Does my house have to be fumigated? Very, very (VERY) rarely will a home have to be fumigated for our Los Angeles termite inspections services, and we year at Tree Bark Termite and Pest Control are going to do absolutely everything we can to make sure that we don’t have to go forward with this “nuclear option”. 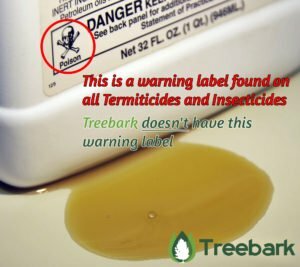 As we highlighted above, we have a variety of different patented solutions that we have pioneered, solutions that are only ever going to be dangerous to the termites and the pasts that you are looking to get rid of – solutions that won’t ever threaten the health or happiness of the people or pets that are living in your home. When our trained technicians deploy these methods, they are going to go through a variety of different steps and processes to make sure that the solutions are not only effective but also contained to the specific areas that we are deploying them. Combine that with the ultra safe and reliable termite protection Los Angeles solutions that we later put in place after we have destroyed the existing issue and you’re talking about a truly safe bubble and that’s going to protect you, your loved ones, and your property while making sure that termites never set up shop in your home again! If you’re ready to learn a little bit more about how we are able to help you when it comes to your termite control Los Angeles needs, simply contact us at your earliest convenience. You can shoot us an email (info@treebarktermiteandpestcontrol.com) or you can call us at 949-220-2673. Someone from our office will get back to you just as soon as possible, and we’ll set up a 100% free and no strings attached consultation and inspection so that you can better understand everything that we have to offer.